We always ponder the priority with which we need to work on parts of the deluxe shed. We need running water, electric, and heat. There are lots of things that need to be done in a particular order so that we can get electric, water and heat. Would you believe a deck around the entire place is one of those things? You see, we plan to bury the electric from the pole to a wooden “electric wall” on one side of the house on which the meter and shut-off will reside. We have always planned on a wrap-around deck so to build the wall, we need to know exactly where the deck is going to be. Once that is done, we can trench between the pole and the wall. The rest is sort of easy once that is done. I don’t know if you have ever been to West-by-God-Virginia, but we have mountains here. There is precious little flat ground here and that which does exist floods every time it rains. So, we are building on an incline and in the mud. It has been fun! 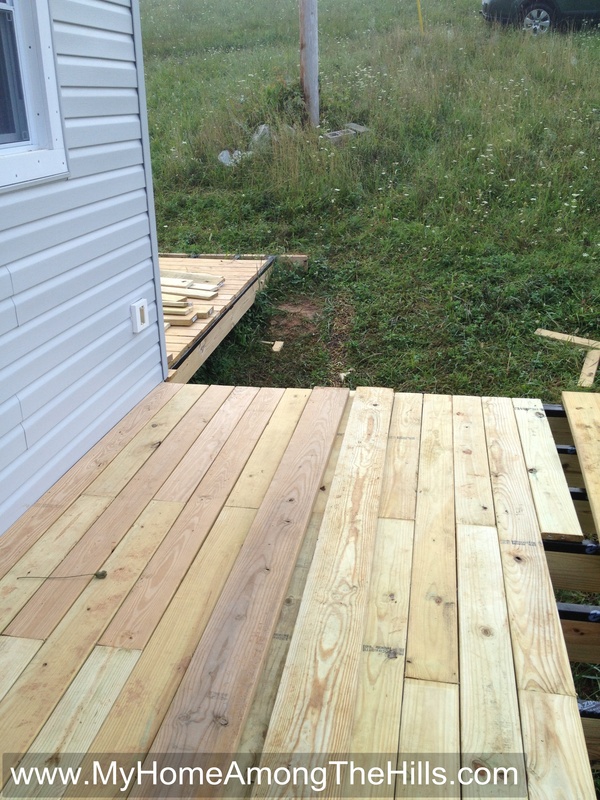 We finished the deck on one side and that has been great as far as getting us in and out of the house…and out of the mud! The remaining sides are all elevated, with the highest being 9 feet off of the ground. 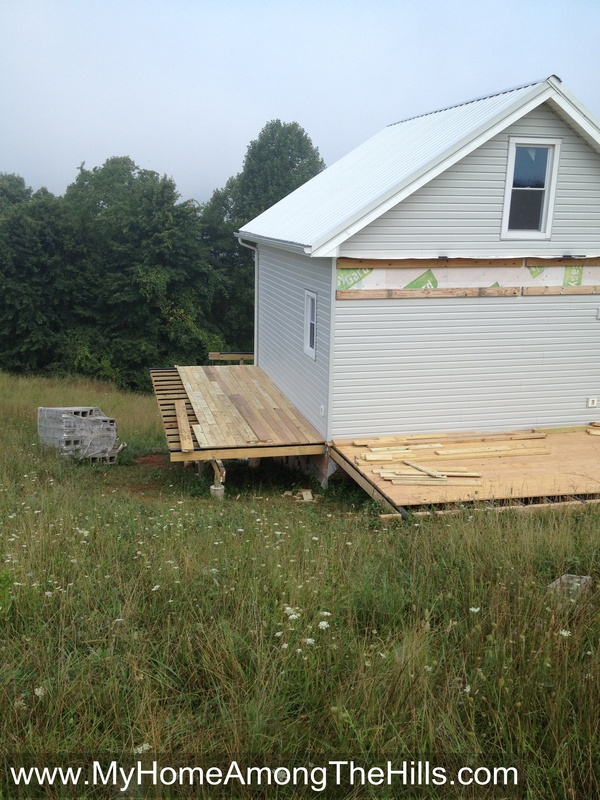 Still, building deck is easy and makes a dramatic change to the appearance of the place…plus it will allow us to finally get electric, water and heat! 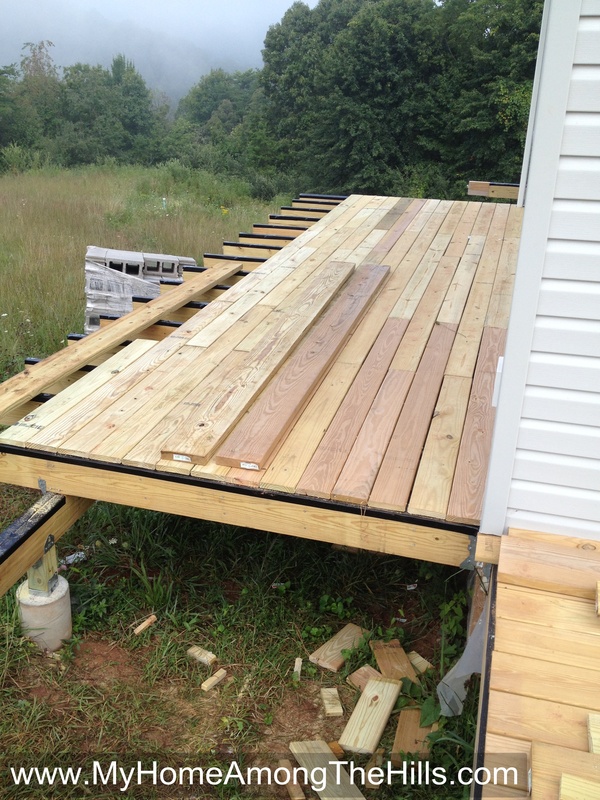 Here’s the cool part about the side deck…Emily, with a little help from Isaac, completely finished it completely by herself. I was working on the bees while she sawed and hammered and cussed. 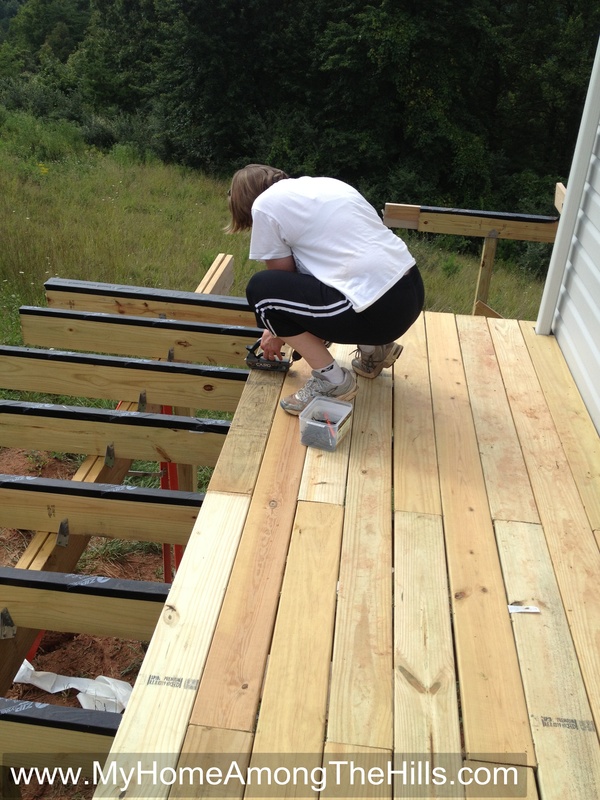 We worked together on the frame but she put all of the decking on by herself! One heck of a woman! Great job Emily! It really does look great. I admire your wife and I WANT TO DO THAT. Your “shed” looks awesome. Power tools scare me a little, but I think if I get the hang of it, there will be trouble (in the amount of Home Depot expenses I would rack up). Emily is a wonder dog!!!!! I agree with Schmenky, they would probably be real good friends! I have a building project coming up, have you ever thought about renting Emily out when she isn’t working on your shed? Glad y’all are having a bit or “normal” at your house. She’s a keeper for sure! She works cheap too! GO EMILY : ) it’s all looking great!